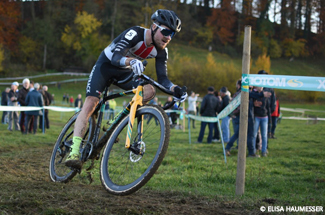 On Boxing Day Gosse started in the seventh round of the Telenet UCI Cyclo-cross World Cup in Heusden-Zolder, Belgium. After a good start he had bad luck again. No Christmas diner for Gosse, but an hard hour of racing at the car racing circuit in Zolder. Gosse had a very good start and was in 30th place after a few minutes. “At that moment I was saying to myself: this looks nice, keep your head cool. Just at that moment a rider in front of me crashed and hit me, so I was launched into the gravel and got stuck. When I got back on the track I was laying 65th or so. Honestly my legs weren`t that good also, so that made it even more difficult today. I still managed to get back to a 38th position, but lost some positions in the end and finished 44th”, a dissapointed Gosse told after the race. The 7th World Cup of this season was also Gosse`s last race of 2018. On the 2nd of January he will ride in Meilen, followed by a race in Shrewsbury on the 6th of January.